Caring for a dog no matter what its age takes a lot of work and dedication. They, however, deserve every moment that you dedicate to them. What can be an additional responsibility is caring for a dog that is sick. The first thing that has to be done is to determine what the cause of the sickness is. In most cases, dog owners will take their dog to the veterinarian to determine this. Once the cause of the sickness has been identified then this professional will usually give instructions for their care and this can vary depending on the degree and severity of the illness. If the dog is suffering from something minor such as an upset stomach then it is not always necessary to take them to the vets. The proper care, in this case, would be to make sure the dog is not being overfed. A light diet is better for a day or two. It is also important that they have a constant supply of fresh water. No matter what the age of the dog reducing the amount of exercise they are getting while they are not feeling well may be a good idea. Even though the dog is not feeling well they may still push themselves to go out for their beloved walks or to rough house with the children. Allow the dog to get as much rest as possible and in a quiet place. Now it may be the time to give them a warm fuzzy blanket to snuggle into. That is of course if you are sure that your dog isn’t going to chew it. 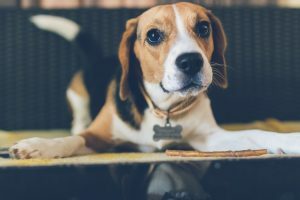 If the illness is such that you have had to take the dog to the vet then you should consider it somewhat serious even if it is something that is easily corrected with medication. Giving the medication that the vet has prescribed is very important. This can be a challenge if normally the dog is home alone during the day. Especially if the medication has to be administered during these hours. You may have to arrange for a family member to come and stay with the dog so the dog can get the proper attention. 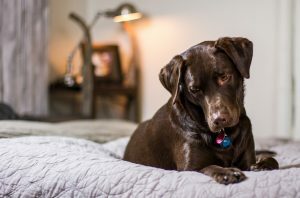 Another solution may be to see if a neighbour that is familiar with the dog would be willing to check in on the dog and give the medicine if needed. This can be a bit of task and an inconvenience but it is a necessary one.